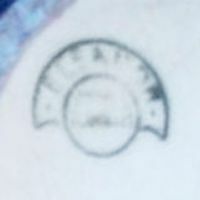 This mark appears to have been used by an US importer or distributor. 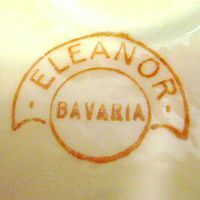 It is commonly found on otherwise unmarked items, however there are some cases where one of the Eleanor marks can be found together with a true manufacturer mark. Examples would include the original marks by Franz Prause (Niedersalzbrunn, Silesia), C. Schumann (Arzberg, Bavaria) or Schumann & Schreider (Schwarzenhammer, Bavaria). Some people claim the color of the mark could indicate the true manufacturer (as in "blue is Schumann") but that approach is incorrect as various double-marked items speak against that theory; I know of a red Eleanor mark on a Schumann item, for example. The first mark shown here may have been the earliest version, just before 1918. The normal marks shown here all came later, right up to around 1930 as all additional manufacturer marks found so far were versions used after World War I. 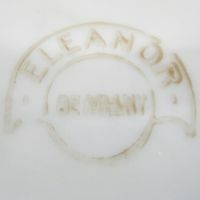 Please take note that the Eleanor mark is not a decorator mark as some sources claim, one only has to compare both original and Eleanor-marked items to see that. Used shortly before 1918. 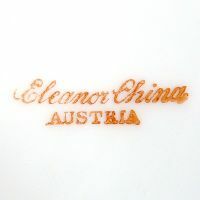 Simple 'ELEANOR CHINA' above 'AUSTRIA'. Used between 1918 and 1921, 'ELEANOR CZECHO-SLOVAKIA' mark in black. No exact dates known. 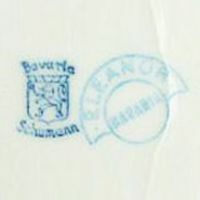 'ELEANOR BAVARIA' mark in blue together with a Schumann (Arzberg, Bavaria) manufacturer mark (1918-1929?). No exact dates known. 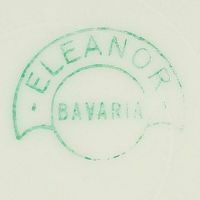 'ELEANOR BAVARIA' mark in green. No exact dates known. 'ELEANOR BAVARIA' mark in red. No exact dates known. 'ELEANOR GERMANY' mark in brown. No exact dates known. 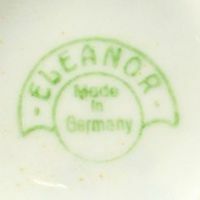 'ELEANOR MADE IN GERMANY' mark in green.